Thank God it’s Friday! Time for some fun nightout with friends. 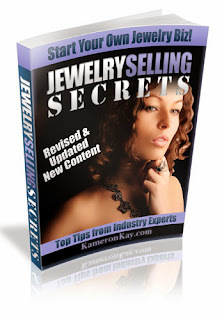 Needing a new pair of earrings to match your outfit? 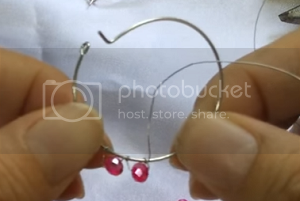 Here’s a quick wire wrapping tutorial for making a sparkling pair of earrings. The tutorial is so easy that you can make a pair in just 15 minutes! Bring up a hoop earring and your 28ga wire. Leave at least a few centimers tail end, just enough for you to hold the wire and then wrap the other end or the longer end 3x onto the hoop. After wrapping 3x you will see the wrapped wire has spaces. Move the wire closer to each other by pinching with your fingers. 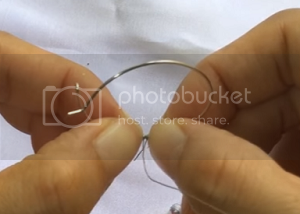 Slide in a glass bead and wrap the wire one more time onto the hoop to secure the glass bead. Now, the bead is secure. 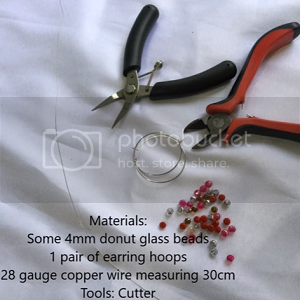 Repeat from Step 1 – 4 and continue wrapping the wire with glass beads until you have covered the hoop with glass beads, but leave a few centimeters space for your ear. 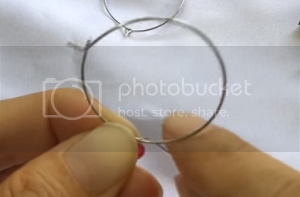 Finish your earring hoop by wrapping the wire at least 3x. Once your are satisfied and the wire is secure cut off excess wire. 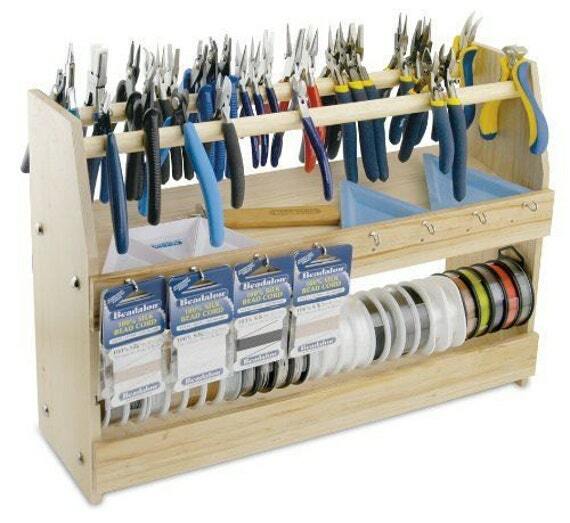 Finally, pinch the wrapped wire with your flat nose pliers to there are no sharp edges. 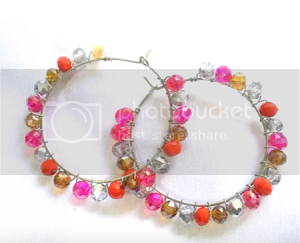 Create a pair of beautiful sparkling earrings with hoops! 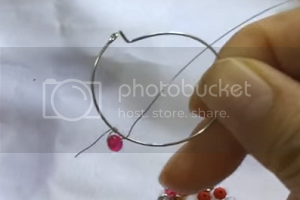 Wondering how to make the earring hoops? Follow these simple 4 steps! 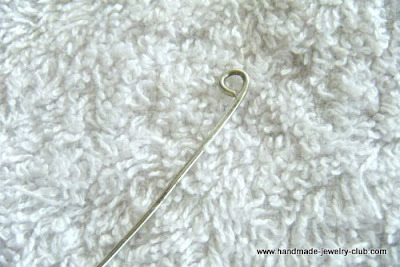 Depending how big you would want your earring hoops to be, cut 20 ga or 18 ga wire adding at least 0.5 inch for the loop. 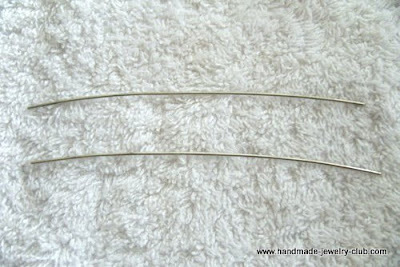 Measuring 0.5 inch from the tip of the wire, with your round nose pliers, grip the tip and make a turn to create a loop. 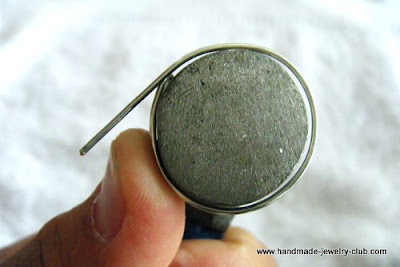 Use a round object, a spool or mandrel and shape the wire like shown in this picture. 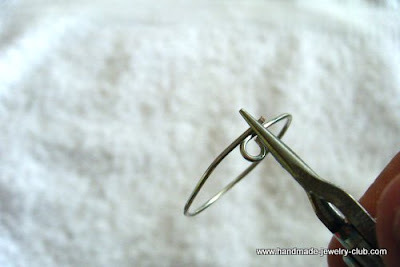 Using the tip of your flat nose pliers, bend the tip of the wire and cut off excess wire. 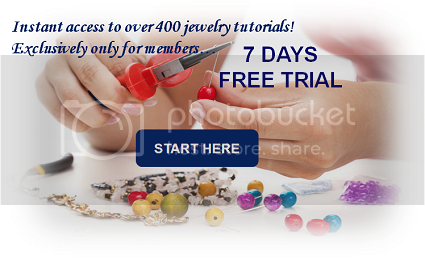 Have a nice jewelry making weekend!